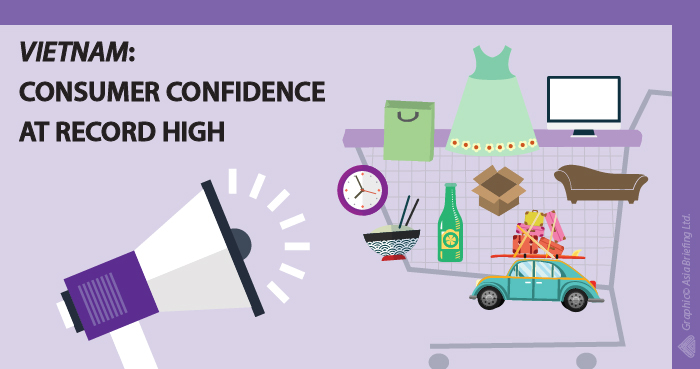 Vietnam’s consumer confidence hits a record high according to the recent Nielsen Q2-2017 Consumer Confidence Index. The country stands as the fifth most optimistic country with an index score of 117, up five places from last quarter of 2016 and its highest score in the last five years. The Nielsen study aims to measure the consumers’ confidence, concerns, and spending intentions. One of the major changes in comparison to Q4 2016 is the decrease in the percentage of the population who put their spare cash into savings. Last quarter, 76 percent of Vietnamese diverted their spare cash into savings, while in this quarter, it reduced to 63 percent. Vietnam continues to spend on big-ticket items and the increase has been attributed to personal finance and spending intentions. Consumer’s lifestyle and preferences in Vietnam is changing fast, driven by an increase in income and urbanization. After spending on essential living expenses, one in three is willing to spend on various consumer products and services. About 38 percent are willing to spend on holidays, while people willing to spend on new clothes and technology products account for 36 and 31 percent respectively. Willingness to spend on home improvement and out of home entertainment accounts for 30 and 29 percent respectively. For the first time in the Index, medical insurance has emerged as an area where people are willing to spend. In Q2 2017, 23 percent of the population was paying premiums for medical insurance. The top five consumer concerns in the survey were the same as last year. Job security was the leading concern accounting for 48 percent. Following that, health and work/life balance accounted for 38 percent and 25 percent. State of the economy and parents welfare accounted for 20 and 17 percent respectively. Financial security continues to be one of the major concerns in Vietnam, which is a direct result of job security and economy. Southeast Asian consumers continue to lead the rankings. Four ASEAN countries feature amongst the top 10 global countries with highest consumer confidence. Philippines leads the global rankings with an index score of 130, followed by Indonesia at third with a score of 121, Vietnam at fifth with a score of 117, and Thailand dropping to 10th with a score of 107. Malaysia and Singapore witnessed a growth in levels with a score of 94 and 89 respectively. In terms of saving, Thailand leads with 69 percent of the population putting their spare cash into savings, followed by Singapore and Indonesia at 66 percent and 63 percent in Vietnam. The consumer lifestyle in Vietnam is changing rapidly and an increasing number of consumers are ready to spend on big-ticket items, largely driven by a rise in income, growth of the middle class, and an increase in urbanization. Manufacturers and retailers have to stay up to date with the consumer trends to meet their demands, as consumer preferences tend to evolve much faster now than they used to do earlier. Industries that may see an increase in consumer spending are tourism, retail, electronics, and health products.